London - Blackburn Rovers were relegated from the English Premier League with a match to spare after a 1-0 defeat at home to Wigan on Monday. In a match they had to win to prolong their 11-year stay in the top flight, Blackburn were unable to find a way through Wigan's defence. Wigan, for whom victory secured their Premier League survival, scored the only goal of the game through Antolin Alcaraz's header three minutes from time as they recorded their sixth win in eight league games. Blackburn joined bottom of the table Wolves in being demoted, leaving Bolton, QPR and Aston Villa in a battle to avoid the third and final relegation place on Sunday's final day of the season. 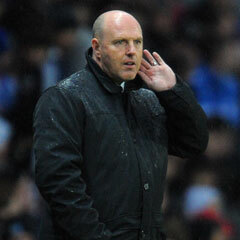 Defeat at a rainswept Ewood Park capped a difficult season for Blackburn, whose Scottish manager Steve Kean has faced repeated calls from supporters to quit the north-west club. Fans have also protested against the involvement of Blackburn owners Venky's, an Indian-based poultry firm, in the running of the club. Both Kean and Venky's were subjected to fresh chants calling on them to leave from angry Rovers fans on Monday, with one supporter releasing a chicken onto the ground in protest during the first half. Blackburn won the Premier League title in 1995 when lifelong fan and steel magnate Jack Walker was still bankrolling the club and current Liverpool boss Kenny Dalglish was their manager. But Rovers have struggled to recapture those glory days since Walker's death in 2000. Blackburn conclude their Premier League campaign away to FA Cup winners and Champions League finalists Chelsea on Sunday.